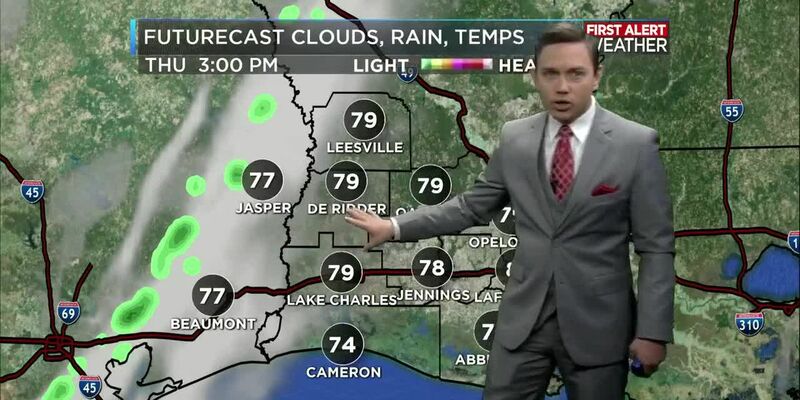 LAKE CHARLES, LA (KPLC) - Through the rest of the day, it will be nice and sunny with no chance of rain. The clouds will be limited, so it will be another day with abundant sunshine. Temperatures will be very warm and should reach the mid 80s. It should not quite get as warm as yesterday. The reason for that is the southerly winds bringing the humidity back. This evening, it will be very nice. The clouds will still be limited, and the sunset should be beautiful. The winds will also calm down a little bit. There will still be a slight breeze, but it will not be as windy as the afternoon. Temperatures will still be warm in the mid to upper 70s. After sunset, temperatures will cool a little faster. Overnight, it will be nice and clear with only a few small passing clouds. Those clouds will have little impact to our weather. It will be a little warmer thanks to the southerly winds we saw today. Those winds increased the humidity just a little bit making it harder for the temperature to cool overnight. Thursday will have a weak cold front push through. This may bring a few light showers in the afternoon. In the morning, I think it will still be nice and sunny, but the clouds will be increasing into the afternoon. I have a 20% chance for a couple showers popping up. This will be light rain, and a quick event. So, it will not last long, nor do I think everyone will see rain. This may cool the temperature just a couple degrees as we end the week. Friday will remain a dreary looking day. I have increased the rain chance to 30%. There will likely be a few showers in the afternoon and evening. It shouldn’t be a washout, but I would be prepared for some rain. I do not expect a lot of sunshine. I wouldn’t be surprised if there were a peek or two every now and then, but it will overall be limited. Temperatures will reach the upper 70s for the afternoon high. This next weekend will have a lot of rain around. Saturday is the day to try to be indoors. 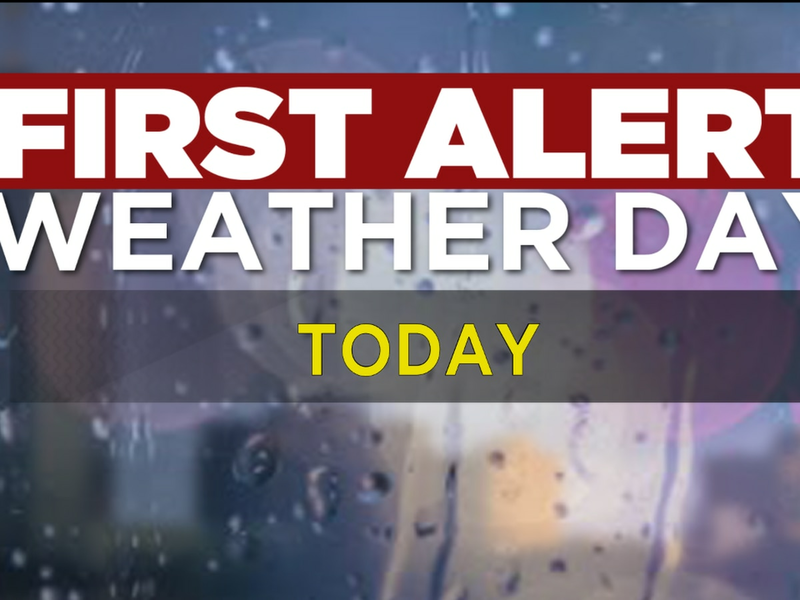 There will likely be rain scattered throughout the day. At times, there will be some thunderstorms as well. 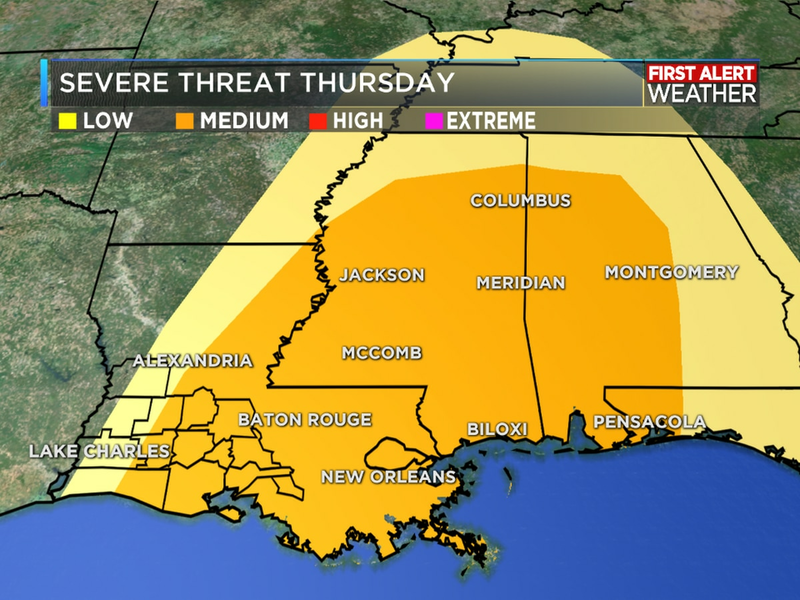 As far as any severe weather, it is possible. It is still a long way out, so it could change. This is something we will monitor over the next few days. 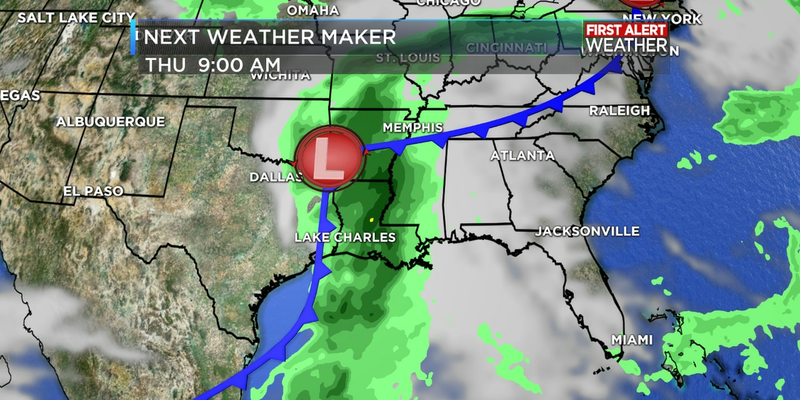 As the cold front sweeps through the area Saturday, it will bring a lot of rain, especially in the afternoon and evening. By Saturday night, most of the rain will start to come to an end. There will be no more strong storms by that time; only some light rain. It is trending that Sunday will actually be a nice day. There may be some morning showers, but the rain will come to an end by the afternoon. We may even get to see the sunshine as well! It will start off on a dreary note but will end on a beautiful note. By next week, the weather is looking better. There should not be any rain on Monday, but there will be a few clouds. There will also be plenty of sunshine mixed in as well. So, it should be a nice start to next week. Temperatures will be in the mid 70s in the afternoon. 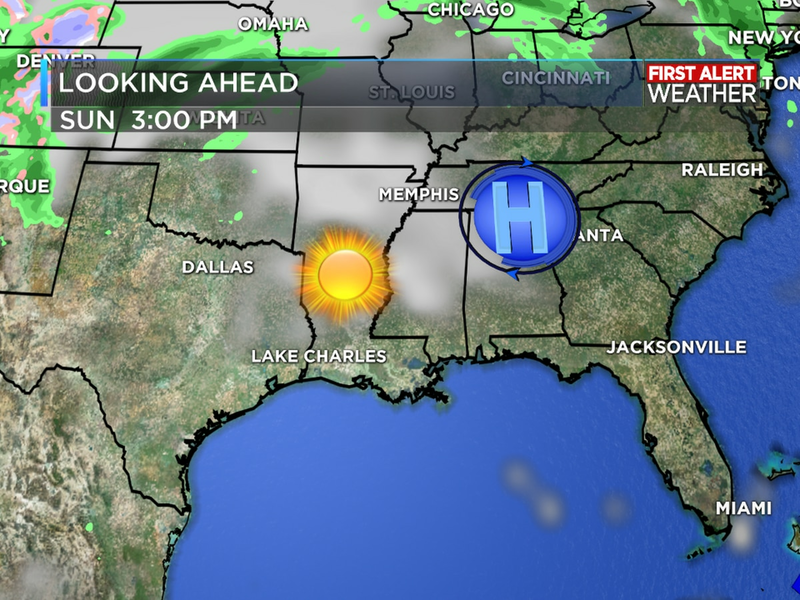 Tuesday should also be a nice day, but with a few more clouds. 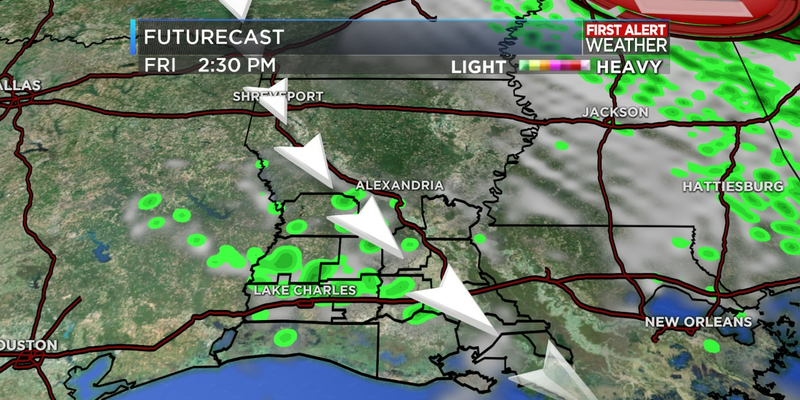 Rain chances are very low, but some wrap-around moisture behind a departing upper level low will bring some clouds at times and a few quick moving showers parts of Southwest Louisiana, but any should be brief and not cause you too many issues.